Pangsit Mie Pengampon, Jl. Pengampon, Surabaya, Indonesia - my name is Food. Now, the place is in an alleyway, so you definitely can miss it if you don't have anyone there with you since the alleyways are quite similar along this road. I didn't even know where we were going but I just kept hearing loud noises and the next thing I know, a small size eatery specializing in noodles had people waiting in line, seats and tables were filled, people ordering 20 to 50x takeaways whilst the employees seemed to be working as fast as they can to try and get all their orders done. And did I mention that this was early in the morning? Not even 9am from what I remember. 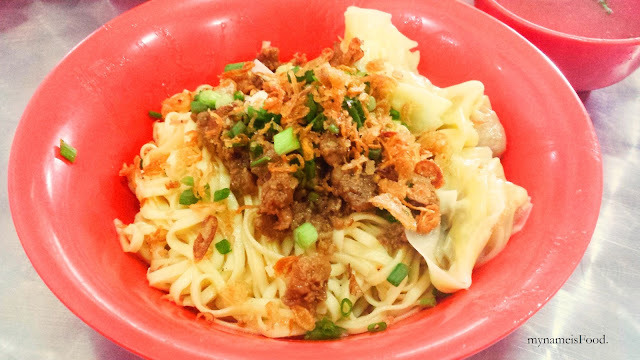 'Pangsit Mie' (don't remember exactly, roughly IDR25k - AUD$2.5) is basically Wonton Noodle when translated literally into English. 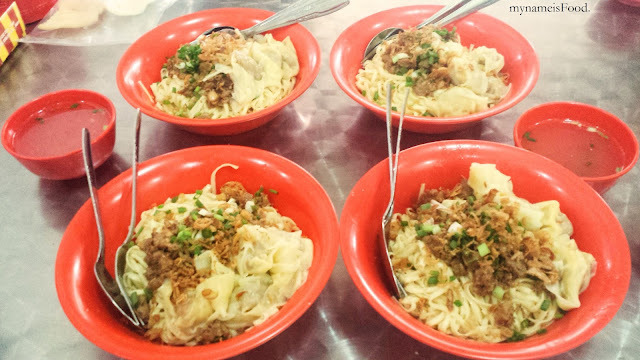 It is a dish which has been brought from the Chinese region prepared simply by making the noodles handmade, topping the noodles with minced pork marinated in soy sauce and also, fried onions and chives. Sometimes they do add a slice or two of greens such as chinese spinach or bok choy or such and this is usually served with a bowl of broth. 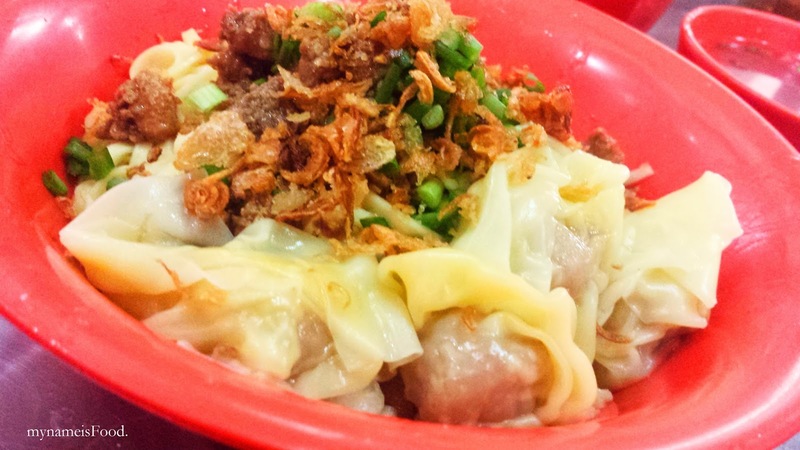 The noodles are yellow noodles and accompanied by wonton (pangsit). From what I remember, I know some places allows you to order half portions, but some may not. I like to add in the broth about halfway of the bowl or even sometimes, all of it into the noodles and mix it all up. I find that it brings the taste, texture and flavour out more than by you sipping the broth by itself and also eating the noodles by itself. I really enjoyed this simple dish, the non-sticky noodles had a light flavour of sesame oil and light soy sauce I think and really combined well with the marinated soy sauce pork. The wonton was boiled nicely with lots of meat inside, and the wonton skin was so smooth and silky. 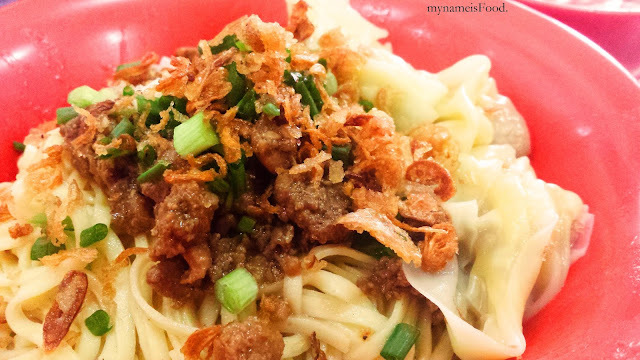 A definite must try for a simple authentic Indonesian noodle dish.